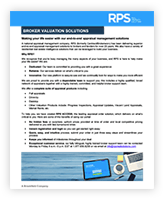 A national appraisal management company, RPS has been delivering superior end-to-end appraisal management solutions to brokers and lenders for over 20 years. We are proud to provide you with a dependable team to support you; this includes a highly qualified, broad network of appraisers together with a highly trained, committed, and helpful broker support team. We offer a complete suite of appraisal products including full appraisals, drive-by, desktop, as well as other valuation products such as but not limited to, progress inspections, appraisal updates, vacant land appraisals, market rents. Recognizing that you’re busy managing the many aspects of your business, RPS is here to help make your life easier! We have created RPS ACCESS, the leading appraisal order solution, which delivers on what’s critical to you. Some of the benefits of using our portal include no hidden fees, instant registration and login, quick, easy and intuitive process and exceptional customer service. Interested in enhancing your clients’ experience and adding more value with meaningful residential real estate intelligence? We have an extensive variety of data and analytics solutions designed to maximize your business success and client experiences. RPS’ products can provide insights into your portfolio and identify valuable opportunities for upselling, cross selling, as well as helping improve your renewals rates. Our solutions are available in many formats to best suit your business needs. For more, see the Appraisal Management Services and Data & Analytics Solutions sections, their respective product sheets, or contact us.